Mars 3 was an unmanned space probe of the Soviet Mars program which spanned the years between 1960 and 1973. Mars 3 was launched May 28, 1971, nine days after its twin spacecraft Mars 2. The probes were identical robotic spacecraft launched by Proton-K rockets with a Blok D upper stage, each consisting of an orbiter and an attached lander. After the Mars 2 lander crashed on the martian surface, Mars 3 lander became the first spacecraft to attain soft landing on Mars on 2 December 1971. It failed shortly after landing. The type of Orbiter was the Variant M-71 of the Bus/Obiter 4M-V. The primary purpose of the orbiter was to study the topography of the surface; analyze its soil composition; measure various properties of the atmosphere; monitor "solar radiation, the solar wind, and the interplanetary and martian magnetic fields". In addition, it served as a "communications relay to send signals from the lander to Earth". The orbiter suffered from a partial loss of fuel and did not have enough to put itself into a planned 25-hour orbit. The engine instead performed a truncated burn to put the spacecraft into a highly-elliptical long-period (12 day, 19 hours) orbit about Mars. The Mars 3 orbiter sent back data covering the period from December 1971 to March 1972, although transmissions continued through August. It was announced that Mars 3 had completed their mission by 22 August 1972, after 20 orbits. The probe, combined with Mars 2, sent back a total of 60 pictures. The images and data revealed mountains as high as 22 km, atomic hydrogen and oxygen in the upper atmosphere, surface temperatures ranging from −110 °C to +13 °C, surface pressures of 5.5 to 6 mb, water vapor concentrations 5000 times less than in Earth's atmosphere, the base of the ionosphere starting at 80 to 110 km altitude, and grains from dust storms as high as 7 km in the atmosphere. The images and data enabled creation of surface relief maps, and gave information on the Martian gravity and magnetic fields. The Mars 3 descent module was mounted on the bus/orbiter opposite the propulsion system. It consisted of a spherical 1.2 m diameter landing capsule, a 2.9 m diameter conical aerodynamic braking shield, a parachute system and retro-rockets. The entire descent module had a fueled mass of 1210 kg, the spherical landing capsule accounted for 358 kg of this. An automatic control system consisting of gas micro-engines and pressurized nitrogen containers provided attitude control. Four solid-fuel motors were mounted to the outer edge of the cone to control pitch and yaw. The main and auxiliary parachutes, the engine to initiate the landing, and the radar altimeter were mounted on the top section of the lander. Foam was used to absorb shock within the descent module. The landing capsule had four triangular petals which would open after landing, righting the spacecraft and exposing the instrumentation. The lander was equipped with two television cameras with a 360 degree view of the surface as well as a mass spectrometer to study atmospheric composition; temperature, pressure, and wind sensors; and devices to measure mechanical and chemical properties of the surface, including a mechanical scoop to search for organic materials and signs of life. It also contained a pennant with the Soviet coat of arms. Four aerials protruded from the top of the sphere to provide communications with the orbiter via an onboard radio system. The equipment was powered by batteries which were charged by the orbiter prior to separation. Temperature control was maintained through thermal insulation and a system of radiators. The landing capsule was sterilized before launch to prevent contamination of the martian environment. 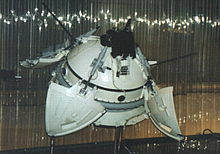 Mars 3 lander had a small 4.5 kg (9.9 Lb) 'Mars rover' on board, which was planned to move across the surface on skis while connected to the lander with a 15-meter umbilical cable. Two small metal rods were used for autonomous obstacle avoidance, as radio signals from Earth would take too long to drive the rovers using remote control. The rover carried a dynamic penetrometer and a radiation densitometer. The main PROP-M frame was a squat box with a small protrusion at the center. The frame was supported on two wide flat skis, one extending down from each side elevating the frame slightly above the surface. At the front of the box were obstacle detection bars. The rover was planned to be placed on the surface after landing by a manipulator arm and to move in the field of view of the television cameras and stop to make measurements every 1.5 meters. The traces of movement in the Martian soil would also be recorded to determine material properties. Because of the demise of the lander, the rover was not deployed. Mars 3's descent module was released at 09:14 UT on December 2, 1971, 4 hours 35 minutes before reaching Mars. The descent module entered the Martian atmosphere at roughly 5.7 km/s. Through aerodynamic braking, parachutes, and retrorockets, the lander achieved a soft landing at 45°S 202°E﻿ / ﻿45°S 202°E﻿ / -45; 202Coordinates: 45°S 202°E﻿ / ﻿45°S 202°E﻿ / -45; 202 and began operations. The lander began transmitting to the Mars 3 orbiter 90 seconds after landing. After 20 seconds, transmission stopped for unknown reasons. It is not known whether the fault originated with the lander or the communications relay on the orbiter. The cause of the failure may have been related to the extremely powerful Martian dust storm taking place at the time which may have induced a coronal discharge, damaging the communications system. The dust storm would also explain the poor image lighting. A partial image (70 lines) was transmitted. Although this image appears to show the horizon and dark sky, the photograph was taken with a cycloramic camera. This means that to correctly view the photograph it should be turned 90 degrees clockwise, assuming the rover did land upright when it landed at the time of the global Martian dust storm. According to the Soviet Academy of Sciences there is nothing, horizon or otherwise, identifiable in the photograph. A cut-away view of the Mars 3 Lander at the NPO Lavochkin Museum. On 11 April 2013, NASA announced that the Mars Reconnaissance Orbiter (MRO) may have imaged the Mars 3 lander hardware on the surface of Mars. The HiRISE camera on the MRO took images of what may be the parachute, retrorockets, heat shield and lander. The Mars 3 lander hardware was found by amateur space enthusiasts looking through publicly available archived images. Candidate hardware for 1971 Soviet Mars 3 lander. The predicted landing site was at latitude 45 degrees south, longitude 202 degrees east, in Ptolemaeus Crater (images: HiRISE, MRO - November 2007/left & 10 March 2013/right). ^ a b c d Webster, Guy (April 11, 2013). "NASA Mars Orbiter Images May Show 1971 Soviet Lander". NASA. Retrieved April 12, 2013. ^ a b c Perminov, V.G. (July 1999). The Difficult Road to Mars - A Brief History of Mars Exploration in the Soviet Union (PDF). NASA Headquarters History Division. pp. 34–60. ISBN 0-16-058859-6. ^ "Failed Soviet Mars spacecraft found?". 3 News NZ. April 15, 2013. Archived from the original on 2014-02-01. Retrieved 2019-01-18. ^ "Как мы искали Марс-3 (Russian)". zelenyikot.com. 11 April 2013.